I think it's fair to say that London in the mid-1800s wasn't always the desirable tourist destination it is now: a bit rough, a bit grimy, a bit "Oh bother, I left my merkin in my other pants." But for all its back-alley seediness and choking black smog, it sure is a pretty place. The new Assassin's Creed: Syndicate trailer doesn't show off anything in the way of action, beyond a few seconds of bare-knuckle brawling, and a couple of "don't try this at home" swan dives. But that's okay, because that's not the point: The point is to show off what looks like it will be a really cool playground to run around and murder people in. 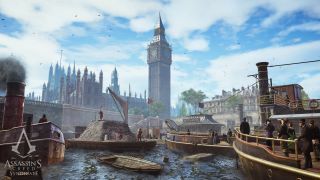 Phil said in his hands-on with Assassin's Creed: Syndicate last month that it "looks beautifully detailed," but he also expressed some concerns about it possibly being overloaded with gimmicks. Barring another delay, we'll find out in November.